The Mariners lost again today against the Angels, this time 4 to 2. Hector Noesi didn't pitch too bad, but he did give up a couple homers. Thankfully neither of them were to Albert Pujols today as they were in the first three. Today's problem? The hitting. Surprised? I doubt it. Today the Mariners managed to get just 3 hits in a full nine innings. Before I go on my tirade, some of you may want to point out that this was just one game, but I call hogwash. It's been more than one and it's been more than the last four. Even in our series versus Texas in which we took 2 of the 3 games we could hardly hit. We survived mostly on a Texas pitching staff that allowed more walks than I have ever seen in a series. They gave us those games. In the past 4 games, the Mariners have managed to get only 18 hits in the four games combined. That's only 4.5 hits per game. We cannot continue to allow this to happen as fans. 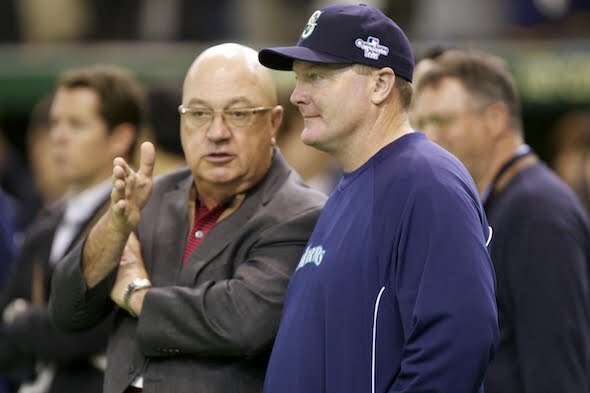 Throughout a myriad of managers, GM's, hitting coaches and players, the Mariners still have yet to find a way to win ball games. No managerial change is going to help this offense, we've tried that. It's not our GM, it's not our hitting coach, and even though I really disagree with Eric Wedge much of the time, it's not him either. The overall problem with our team is mental. We invite players into a stadium that is known for being a pitchers park and ask them to hit the ball. It gets into their heads. When you lay some good wood on a ball and start into that famous homerun trot only to find that the ball was snagged on the warning track, that is hard to swallow for a player. For fans, it's getting down right depressing. Take Adrian Beltre's career for an example. He was massively insane with power when he was with the Dodgers before Bill Bavasi signed him and Richie Sexson to contracts as Mariners. They both came here and we watched their numbers take a dramatic dip. That's where they remained. Now that Beltre has gone on to Boston and now Texas, we can see him become the player that we only wished he were as a Mariner. He could have been that guy, but we were too busy counting our pitching stats to realize every single one of our stars were leaving the team. So I want to call for a strike. As fans, can we strike for change? Can we force the hands of our front office to finally make that tough decision and move in the fences? We may give up a couple more runs in a game, but if these young players that we currently have can gain some confidence at the plate, I would bet that we start to outscore the majority of teams out there with consistency. Justin Smoak, Jesus Montero, Dustin Ackley, Kyle Seager, Michael Saunders, all of them are power threats if we just took off about 15 feet in the gaps and in left field. Then we would look something more like an Angels lineup. Then we would start to be an intimidating team and not look so much like a team that should be swept in their own ballpark. It's time for a change and it starts with the fences. I doubt our staff ace would mind at all. His loss this home stand came on two hits that Safeco couldn't hold. If Felix Hernandez were to talk and share his feelings concerning this matter, I'm sure he would rather score runs and deal with a smaller park than continue like we are. So, I hereby call a strike. No games, just bring in the fences! And hurry up about it, there is way too much at stake.